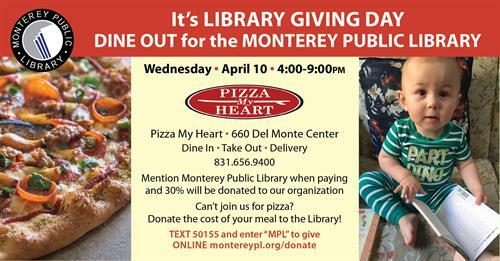 Dine out or donate the cost of your meal to the Monterey Public Library! Dine at Pizza My Heart, 660 Del Monte Shopping Center and help raise funds for the Library and celebrate #LibraryGivingDay. Week. Dine In, Take Out and Delivery qualify (831) 656-9400. All you have to do is mention that you are supporting the Monterey Public Library and 30% of your purchase will be donated to the Library. Can’t join us for pizza? Donate the cost of your meal to the Library. For more information call (831) 646-5632 or visit www.monterey.org/library. Pizza My Heart, 660 Del Monte Shopping Center, Monterey, CA. (831) 656-9400. Dine in, take out, or delivery qualify. Wednesday, April 10, 2019, 4:00 to 9:00 p.m. Restaurant bill. 30% donated to the Library when you mention Monterey Public Library.